Hei mukavaa perjantaita! Säästä ei nyt sitten puhuta mitään, joulukortilla aloitetaan viikonloppu. Mustavalkoinen kortti Stempelgleden vintageleimasimella, kohokuviota ja stansseja. 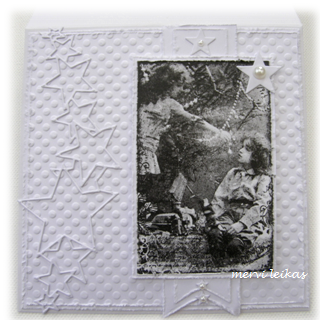 Die-namic's fishtails, Simon Says Stamps star parade and pearls - and just white cardstock. Beautiful card, lovely design with that fab embossed WOW background! Thanks for joining us at Creative Moments. I really like what you've created here, with all the white detailing and the beautiful black and white vintage image. Lovely! oh Wow how beautiful this is!!! Love the vintage feel and the stunning way it looks with just the black, grey and white. Thanks so much for joining us this week at Sketch Saturday!